“I don’t measure achievements based on revenue figures or awards. I feel an achievement is when you enjoy doing what you are meant to do every day”, says Sandy Samuel Jerome mother of two and CEO of Somey’s Kitchen (Speciality food producer). 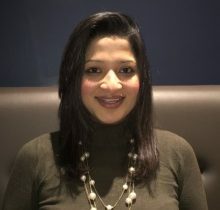 She has lived in the UK for close to ten years now and has been donning the hat of a successful mompreneur since 2015. Somey’s Kitchen started small by selling its products online and in small Asian stores in West London. 2017 however was a big year when Sandy and her husband realised that it was time to take it up a notch. They sold her house in London and moved to a small town called Rugby to raise money and build a factory in India. In March 2018, Somey’s Kitchen was launched in the Indian market with the plan of bringing its products to the UK in June on a large scale. Somey’s Kitchen was founded with charity in mind. Sandy and her family do their best to transform the lives of the under privileged and as a first big step, they decided to pledge 50% of the profits from each unit sold, to charity. Speaking from experience, Sandy says, “The single biggest lesson I have learnt is we need to believe in our products/service before others do.” There will be critics and doubters but one must prevail through it all by believing in their product / service and keep moving forward confidently. When their products were first launched in the market, they received a lot of push back and negative feedback, but knowing and believing that their products were good they stayed persistent. It was only a matter of time before people were drawn to the taste, quality and core values of the firm and ever since, there is no looking back.